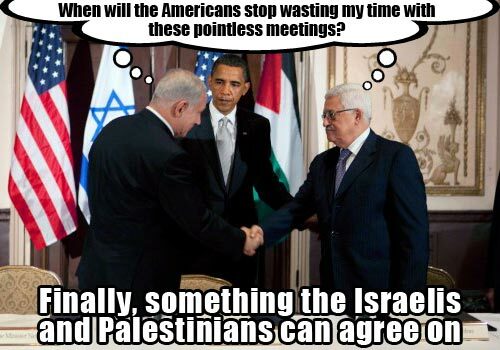 What do Obama and Abbas have in common? Short answer – both are grovellers (definition in a moment). The president of the United States of America grovels to the Zionist lobby and its neo-con and Christian fundamentalist allies. The Palestinian “president” grovels to Obama as well as Israel’s leaders more often than not. Obama and Abbas are, one could say, grovelling twins, but if there was the equivalent of a Nobel Prize for grovelling, it would have to be awarded to Obama. (If when he leaves office Israel is still able to impose its will on the occupied and oppressed Palestinians, I think he should hand back the Nobel Peace Prize he was awarded). I’ll get to my suggestion about what Abbas could do to become a hero in a moment but first let’s explore the terminology. The notion of grovelling apparently comes from the Old Norse language – a grufu meaning face down. (The Norsemen were early Scandinavians and during the Mediaeval period some of them travelled to the British Isles to trade, raid and settle. In the final decade of the 8th century, Norse raiders attacked a series of Christian monasteries located in the British Isles). In the most literal sense grovellers are face down, lying or crawling on the ground in abject humility or fear. So to the question: What could Abbas do to end his grovelling and become a hero? In the coming days, and the sooner the better, he could say, in the most polite and gentle way possible, something like the following. I would also have Abbas say in his statement that a concrete plan to get a real peace process started would not be enough on its own. And I would have him explain why as follows. To give a concrete plan real meaning Obama would have to indicate when he presented it that if Israel remained committed to defying international law and UN Security Council resolutions, the U.S. would have no choice but to use the leverage it has to cause (or try to cause) Israel to be serious about peace on terms that would provide justice for the Palestinians and security for all. Such an approach would require Obama to say in public what President Kennedy said to Golda Meir in a private conversation with her in Florida two days before his last Christmas. Kennedy defined what he called the “limitations” of America’s relationship with Israel, a relationship, he said, that was “a two-way street.” (The story of JFK’s secret conversation with Golda, much of what was said is still classified, is contained in Turning Point – The Assassination of President Kennedy, Chapter 11 of Volume Two of my book Zionism: The Real Enemy of the Jews, which is sub-titled David Becomes Goliath. If Kennedy had been allowed to live, he was intending in a second term to require Israel to be serious about peace. After his assassination America’s relationship with Israel became what it still is – a one-way street). In my view Abbas as hero would go much further than saying there will be no point in meeting with Obama if he is not coming with a concrete plan to get a real peace process going and a commitment to do whatever is necessary to make it work. Abbas would also say that if the coming days proved that there’s nothing of real substance to negotiate about because Israel’s leaders are not interested in peace on terms the Palestinians could accept, and can’t be stopped from continuing the colonization of the occupied West bank (on-going ethnic cleansing slowly and by stealth), there would be no point in the continued existence of the Palestine National Authority, and it will be dissolved, handing full responsibility and accountability for the occupation back to Israel. There is no reason to believe that Abbas will end his grovelling to Obama. (In Daud Abdullah’s account of why the Fatah-Hamas reconciliation and unity talks are going nowhere, there was a secret meeting in Ramallah between the US ambassador to Israel, Daniel Shapiro, and Abbas and other PLO leaders, Shapiro requested that they “freeze the reconciliation talks until after President Obama’s visit to the region.” Abbas, Daud Abdullah noted, “dutifully complied”). But what if Abbas did end his grovelling by putting Obama on notice that there would be no point in the two of them meeting if the president was not coming with the commitment to get a real peace process going, AND that a continuation of the status quo would result in the dissolution of the PNA – would that be enough to cause Obama to think seriously about ending his grovelling to the Zionist lobby and its neo-con and Christian fundamentalist allies…? In my view that’s an interesting question. While I think about possible answers to it, I find myself wondering if Abbas would be assassinated if he ended his grovelling to America, and if President Obama would suffer the same fate as JFK if he ended his grovelling to the Zionist lobby and its allies. Could somebody solve a New York Times mystery for me? The electronic edition of this newspaper still arrives in my in-box every day and I can view the menu of its content, but for the last few days I have been unable to open/access any of its reports, op-ed pieces and editorials. As my regular readers know, I quite often quote the NYT in articles I write. (I also tweet them). In the two or three weeks before it became impossible for me to open/access the paper’s content, I quoted several pieces including an editorial that were to some degree critical of Israel. Am I being denied access, blocked? And if so – by whom? I can’t open/access the NYT’s given e-mail contact to put that question directly to the paper myself. American anti-Zionist Jewish writer Jefrey Blankfort and I share opinion about Mahmoud Abbas - He's the most extraordinary double agent in the Middle East. When it comes to Barack Obama, I got to agree with former Jewish Congressman and judge from Chicago, Abner Mikvaner, who predicted in 2008: "I think when it is all over, people are going to say that Barack Obama is the first Jewish President”. Alan, I suggest you open a new NY Times account and do so using a proxy server so that your IP address is concealed. I use anti-tracking software called Do Not Track Me, and its companion called MaskMe, which allows me to log into websites without revealing my identity. As for Abbas, he is, like Israel, too dependent upon American government money to ever stand up to Obama. He will be waiting to meet with him, kneepads on. As I was reading the article, and echoing your closing remark: " I find myself wondering if Abbas would be assassinated if he ended his grovelling to America", I found myself wondering if Abbas had children. Sure enough, acc. to Wikipedia, he does. The eldest died in his early 40's of a heart attack. Even assuming that is the innocent truth, he still has two more sons living, not to mention a wife. A hero might well be willing to risk his own life for the sake of realising a greater good, but rarely can a decent person willingly risk the life of their spouse or child. Basically, we no longer live in a civilised world (if we ever did). In any case, Abbas's role is in the centre of one of the world's most obvious flashpoints, but does not have the power to do that role justice, one of which powers being the ability to protect himself and his family and chief ministers etc. Lacking such power, it is probably not only inevitable but in some way appropriate that he 'grovel'. For after all, he is the erstwhile leader of an illegally occupied region, which has not been given proper statehood so that his people do not have the basic human rights which the U.N. was theoretically founded to protect, even though ironically one of the first things the UN was empower Jews from all over the world to move in and displace people who had been living there for centuries. What is not good is that Obama grovels. General Assembly.We must not forget that Abbas has been the biggest gambler when it comes to the Palestinians' rights that are not for sale: he was the architect of Oslo, which took the West Bank to where it is now. He is also the only Palestinian known to have openly sold his own house( in Safad)publicly.And, he is one of many Palestinian leaders who will happily sell the Palestinian refugees right of return for a dime.But, it is equally true, the Palestinian people are the only party that will have the final say on all their rights.Grovelling or not, Obama has nothing for Abbas to keep him afloat. The only reason Abbas is still in office is because he has blocked the elections, and the Palestinians are too unorganized to have their own Arab Spring. Without strong leadership, another intifada would be suicide. maryam - I sincerely hope the Palestinians never have the so-called "Arab Spring" - otherwise they will lose the remaining 22% of their land.